There is much talk about innovation. CEOs want it, strategists write about it, marketers talk about it and Product Managers strive to deliver it. But companies seem to have difficulty innovating. We are surrounded by many products that are increasingly commoditised with price being the only differentiator. In our whitepaper on innovation, we contend that effective Product Management should be the heart of the company’s innovation program. We examine the fundamental role of Product Management and show that the purpose of Product Management is essentially to execute on the principles of innovation. Innovation is simply just good Product Management. 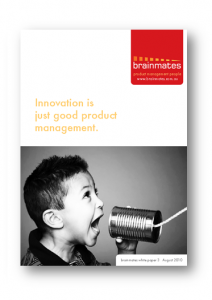 To read what we say about innovation, please download a copy of our white paper.